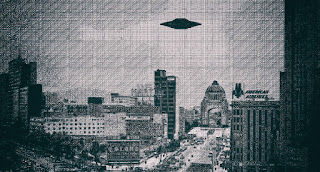 In spite of the considerable number of UFO sightings during this time period, it wasn't until the following decade that the UFO phenomenon would add itself to the other events which stirred the national consciousness, such as increased political radicalism among the young, the massacre of innocents at Tlatelolco in 1968 and the troubled '68 Olympics -- events which mirrored similar developments in France and in the United States. One of the most impressive photographs of a UFO during this period was the 1965 snapshot taken by Juan David Mateos. According to the photographer's testimony, he was driving along the road from Villa Ahumada to Ciudad Juárez, Chihuahua, when he saw a dark, oval shaped craft approaching at an altitude of less than twenty meters and a distance of only sixty meters. Mateos stopped the car and clicked away at the unknown object, earning himself a place in saucer history. On July 10, six residents of the city of Chilpancingo, capital of the state of Guerrero, were left spellbound by the maneuvers of two large, glowing objects in the darkened skies over their community--a two-hour performance which would be replayed later that month over Mexico City, where another pair of brilliant objects remained suspended at treetop level before shooting off into the sky. Two students at Mexico City's Instituto Nacional Politécnico would become the protagonists of a still-debated "close encounter of the 3rd kind" which would be among the first of its kind in the country. The brothers Yayo and Payo Rodríguez achieved national prominence when on the morning of August 19, 1965, at eight o'clock in the morning, they claimed having witnessed the landing of a sizeable glowing disk on an open field near the Politécnico's campus. The otherworldly vehicle allegedly charred vegetation as it settled to the ground on its tripodal landing gear. As if the landing of this spaceship, drawn straight from My Favorite Martian, wasn't enough, the Brothers Rodríguez also claimed that a pair of diminutive beings wearing respirators of some kind emerged from the craft and walked up to the terrified students, depositing at their feet a metallic object. The dwarfish "away team" returned silently to their conveyance, which took to the air in a matter of seconds. The Rodríguezes delivered the putative extraterrestrial fragment to the campus laboratory, where it was apparently subjected to analysis by investigators. According to an article in Mexico's El Gráfico newspaper (defunct) a few days later, a number of journalists and photgraphers from different media organizations visited the site, where burn marks were plainly visible and where traces of a curious liquid, characterized as "fuel" were found. Despite the good physical evidence, Yayo and Payo were not considered credible witnesses. Even Dr. Santiago García, in his landmark book OVNIS Sobre México, would headline his chapter on the Rodríguez case as "¿de cual fumarían?" ("which did they smoke?"). The age of the great UFO-induced blackouts was about to begin during these troubled years. As a foretaste, perhaps, of what would happen later on across the northeastern U.S., the city of Cuernavaca, some fifty miles south of Mexico City, would suffer three separate power failures on the night of September 23, 1965. The Ultima Hora newspaper indicated that the blackout had been caused by a large luminous flying saucer which crossed the heavens over the city--an inverted soup-bowl device which was seen not only by thousands of citizens but by city mayor Emilio Riva Palacios, who was attending the opening of a film festival with members of his cabinet. The lights went out during the showing, and upon going outside, the city fathers were treated to the sight of the massive object's glow, which reportedly filled all of Cuernavaca valley. But the force behind all these aerial phenomena appeared to be enamoured of la capital, Mexico City, with its juxtaposition of massive colonial structures, modern skyscrapers and ancient ruins: it chose the 16th of September, the one hundred fifty-fifth anniversary of Mexico's independence from Spain, to manifest half a dozen luminous objects over the city's skies, casting downtown Mexico City into unbreakable gridlock as drivers left their vehicles to take a better look at the phenomenon. Newspapers reported that aviation authorities had received in excess of five thousand telephone calls from people asking if they had also seen platillos voladores. On September 25, a citizenry weary of craning their necks skyward endured another leisurely display of the unknown as a vast luminous body passed overhead, remaning motionless for a while before shooting out of sight at a terrific speed. Only days later, two smaller objects would buzz the gilded dome of Mexico's Palacio de Bellas Artes, a turn of the century structure that dominates La Alameda park. The early evening sighting was witnessed by a few dozen people waiting at a bus stop; they described the objects as "enormous luminous bodies with intermittent sparkling lights." By this point in time, some of the world's major newspapers had picked up on Mexico's saucer situation. Paris's Le Figaro reprinted an editorial from Italy's Corriere della Sera on the subject: "Mexico City International Airport has officially recorded, of late, some three thousand cases of mysterious apparitions described in detail. At nightfall, people gather on the terraces and balconies of their homes to search the skies...a clamor of voices can occasionally be heard, saying: "There goes one! Can you see it?" Invariably, what follows is this: traffic is paralyzed on neighoring streets, since drivers also want to partake of the spectacle. The roadways grind to a halt, leading to monstrous traffic jams. After a while, witnesses to tho the event are willing to swear that the presence of platillos voladores causes engines to stall and plunges homes into darkness. Throughout Mexico, the number of blackouts has been inexplicably high..."
Spanish ufologist Antonio Ribera, who kept careful tabs on the Mexican scenario, indicates in his book América y los OVNIS (Posada, 1977) that foreign sources as unlikely as Kenya's Mombasa Times were carrying stories about the situation: On October 2, 1965, a fourteen year old girl in the city of Coatzacoalcos, Veracruz, ran away screaming in fright when a flying disk some twenty feet in diameter dropped out the heavens to hover directly over while issuing a soft, whistling sound. The object was surrounded by multicolored lights which appeared to dangle from it. After this daytime apparition, the object was seen over the same city again at night. The coming of 1966 gave Mexico a respite from its ufological experiences, but it was to be a brief one. 1967 would rekindle the frenzied activity of the preceding year. On Saturday, February 11, 1967, a Guatemalan Aviateca airliner managed to avoid a near-collision with a UFO as the airliner prepared its final approach to Mexico City's saucer-plagued airport. The airliner's pilot, Col. Alfredo Castañeda, radioed the tower that a silvery round object, with what appeared to be "a reddish ball" on top of it, had suddenly crossed the airliner's path as it flew over Oaxaca. His co-pilot, the flight attendants and many of the passengers had also been witnesses to the unusual and possibly hazardous phenomenon. Mexico's airport limited itself to saying that the intruder "could not have been a weather balloon." Stories began to circulate on March 30, 1967 regarding the collision of a spindle-shaped object against a hillside near Mezcala, state of Guerrero. A reporter for Ultima Hora indicated that at least a thousand residents of the village of Xochilapa had seen the object plummet earthward and heard the deafening explosion which inevitably followed. Many of the villagers agreed that the heavenly bullet had been roughly cigar-shaped and emitted a blinding light, "making it impossible to confuse with a meteorite." An infantry unit of the Mexican Army was allegedly dispatched to collect the object's remains, but nothing else was heard about the event. Between 8:00 and 8:30 p.m. on May 7, 1967, the Mexican states of Tamaulipas, Tlaxcala, Hidalgo, Veracruz were visited by a veritable celestial armada of UFOs: at least twenty individual blue, yellow and red lights flew in formation over the heads of thousands of bewildered onlookers. The formation was spearheaded by a colossal red saucer and leisurely appeared to be following a northwesterly course. Newspapers in these four states carried the story but no photographs of the formation. A similar occurence took place on August 6, 1967, when the citizens of Poza Rica, Veracruz, were treated to the sight of several "waves" of unidentified flying objects -- each wave having its own color -- as they flew overhead to become lost over the Gulf of Mexico. While the Poza Ricans gawked at the spectacle, Captain Angel Fojo of Aeromexico Flight 145 was facing a similar prospect: at an altitude of twenty thousand feet over the state of Guanajuato, his DC-9 was running into a formation of three glowing disks an estimated 30 miles away from the airliner. Captain Fojo's best estimate was that the speeding objects crossed the horizon in a matter of thirty to forty seconds. The late Jim and Coral Lorenzen of APRO documented a considerable number of cases occuring in Central and South America in '67, and while Mexico's UFO activity during this particular year was by no means as significant as the "fleets" (to use the Lorenzen's own expression) that were engaged in a show of force over Argentina and Uruguay, APRO's files nonetheless contained a few cases of great interest regarding our southern neighbor. As indicated in their book UFOs Over the Americas (Signet, 1968), APRO's founders were on their way to visit a number of South American locations and took advantage of a layover in Mexico City to meet with their correspondent, Jesús H. Garibay, who briefed them on the most important cases at the time. One of them involved two witnesses (a father and daughter) to the landing and takeoff of a UFO, with the added benefit of the photographs taken of the event. The remainder of the year and the beginning of the following one would simply be a repetition of sightings until December 30, 1968, when a mountain rescue team on the slopes of the Popocatepetl volcano witnessed the maneuvers of a strange object conducting maneuvers over the summit of the nearby Iztaccíhuatl volcano. The artifact moved deliberately toward the mountain's eastern glaciers before flying toward Puebla, vanishing from sight. The object would come into view once more during its return trip to the mountains at 8:00 p.m.
Carlos A. Guzmán of Mexico's CIFEEAAC, happened to be one of the researchers in this early case. His group's findings indicated that the mountain rescue team's sighting was corroborated by a number of reports from the city of Puebla at the time: the newsroom of the city's El Sol de Puebla was swamped with phone calls from all over the city, reporting the maneuvers of "a strange white object, as bright as the planet Venus, flying noiselessly over the city." One witness, Francisco Martínez, claimed to have seen not only the object itself, but the various lights which composed it; Reynaldo Ponce, a student at Puebla's distinguished school of architecture, observed the UFO through a theodolite and was able to make a sketch based on his sighting. The entire report was compiled by APRO correspondent Jesús Hernandez Garibay and forwarded to that organization's Arizona-based headquarters. A year later, on September 18, 1968, Antonio Nieto-- a cab driver plowing the city of Coatepec's main avenue -- thought that an otherwise slow night was coming to an end when he pulled over to pick up a fare, or so he thought: his would-be passenger turned out to be a black-clad figure with glowing hands and enormous cat-like eyes that glowed eerily in the taxi's lights as it stood on the curb. The terrified cab driver stepped on the gas and put as much distance as he could between himself and the frightful apparition. As chance would have it, he ran into a fellow cabdriver who had also been hailed by the nightmarish apparition. Leaving one cab behind, both men set off in the other vehicle and went in search of a local journalist, who accompanied them to the spot where the improbable creature had last been seen. Their effort was rewarded by a third encounter with the entity, which now held in its glowing hands a crystal wand which emanated a radiance that hurt the eyes. A staff writer for Mexico City's Excelsior noted that in spite of the ufonauts' vaunted ability to cross space, they encountered the same difficulty as Earthlings when it came to hailing a cab. High Strangeness could also be found in the blue waters of the Gulf of Mexico. On February 17, 1969, an unknown animal washed up on Veracruzan shores at a location known locally as "El Palmar de Susana" between the fishing communities of Tecolutla and Hautla. 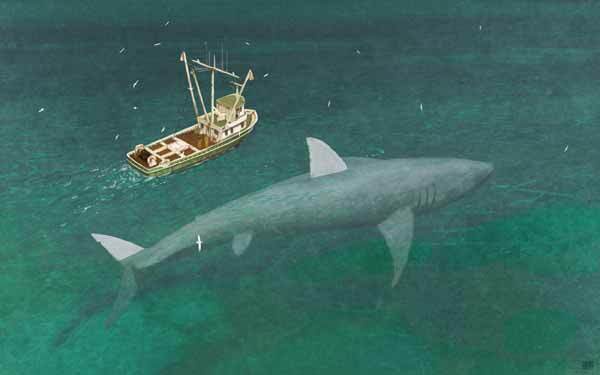 The authorities were dumbfounded by their find: the creature's head weighed approximately a ton, measuring 6 feet across and 4 feet from top to bottom. Scientists who at first thought they were dealing with a decomposing whale carcass were startled by a 9-foot long "beak" that projected from the skull. The creature's hide was described as "wooly" and resistant to all manner of knives, machetes, axes and saws. Biologists Sergio García, Martín Contreras and Daniel Yutch were entrusted with studying the cryptid without reaching any conclusive results. According to Dr. Rafael Lara Palmeros, the mystery remains were purchased by the University of California, and their final whereabouts are equally enigmatic.